Not satisfied being one of the 499 people who own a Ferrari 16M Scuderia Spider? Need more exclusivity than that? Don’t worry – Novitec Rosso has your back. They’ve taken the new lightweight Ferrari convertible and made it even more exclusive – and expensive. The big change here is the power. Novitec has added their own Bi-Compressor system, adding on two belt-driven superchargers tuned to only 7 psi. This new forced induction system increases power to 696 hp – a jump of 186 hp over stock. That’s like taking the Scuderia Spider and adding a V6 Dodge Magnum! To facilitate the added power, Novitec made the Ferrari a new intake manifold with larger cross-sections, higher-flow air filter, and larger fuel injectors. Larger cooling circuits for water and oil, and dedicated cooling systems for the superchargers and intercoolers keep the car running cool under all that power. A re-calibrated ECU lets the car know about the new changes. It’s not all about power, though. Novitec also added a new lowered sport suspension system with a front-lift system so you won’t scrape the front lip on bumps and curbs, and lightweight 20-inch wheels with high performance Pirelli tires. Exterior changes include black taillights, side markers, and reflectors, while on the inside they’ve added a sport steering wheel, and bigger carbon fiber paddle shifters. The 0 to 62 mph sprint is over in only only 3.5 seconds – 0.2 seconds faster than stock. 124 mph is knocked out in only 9.7 seconds, all the way up to the 205 mph top speed (10 mph better than stock) which plants this car firmly into the 200 mph supercar club. The bi-compressor system will cost $66,000 – all other upgrades will be extra. Ouch. 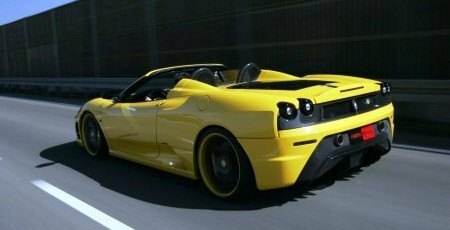 1 Comment on "Novitec Rosso Tunes the Ferrari 16M Scuderia Spider"